Do you have broadband internet? Do you like to watch streaming movies and TV on Netflix? If so, great news: your connection to Netflix is getting faster! Unless, of course, you happen to be one of the tens of millions of Americans who use Comcast or Verizon FiOS for internet access at home, in which case it’s completely the opposite. 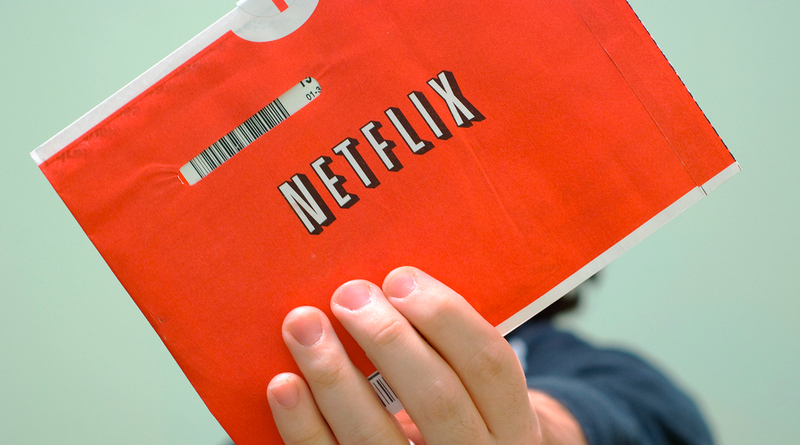 Netflix has updated their monthly internet service provider speed rankings with the first data from 2014. The overall look at 17 major ISPs doesn’t seem too bad. There’s an general upward trend among them all, and while Google Fiber is in a high-speed class by itself, the general pack of other providers looks to be both competitive and improving. US ISP speed data from Netflix, February, 2013 to February, 2014. There are some major exceptions, though, and they happen to include two of the largest internet service providers. In the graph below, the blue (top) line is Verizon FiOS; the green (bottom) line is Comcast. Though both saw improving or stable speeds for most of 2013, the difference after October is stark. Comparison of Comcast and Verizon FiOS connection speeds via Netflix, January, 2013 to February, 2014. Comcast’s average speeds for Netflix users have dropped dramatically in just a handful of months. From January through September of 2013, Comcast bounced around between 2 Mbps and about 2.13 Mbps. But starting in October, their performance fell and by January of this year, their average was closer to 1.5 Mbps. FiOS saw a similar, though not quite as precipitous, drop, from a high around 2.2 Mbps to their current low of about 1.8. Back when Netflix first started publishing their ISP speed rankings in 2012, FiOS and Comcast were in positions #2 and #3, right behind Google Fiber. They currently rank #7 and #14, respectively. The change in measurement, though, doesn’t seem to have caused a dramatic a shift for most of the other ISPs. 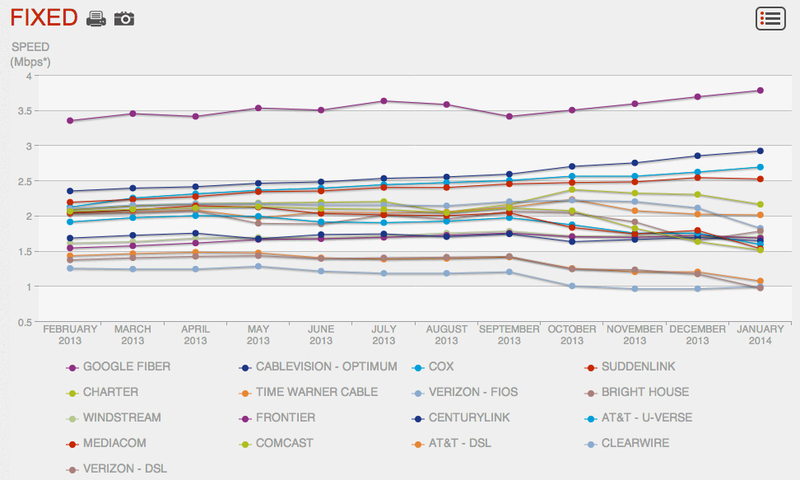 (Medialink and AT&T UVerse also saw big drops.) Several–Google Fiber, Cablevision Optimum, Cox, and Suddenlink–have maintained a decidedly upward trajectory, and many other providers have remained stable or seen a mix of peaks and valleys. So if it’s not just differences in measurement, what’s going on? This data, of course, comes from Netflix and specifically measures Netflix’s connections with broadband providers. There is now no active rule requiring ISPs to treat different internet traffic the same way. So major networks might actually be getting slower… or they might be throttling some of the traffic moving through them. Verizon was accused of causing deliberate bottlenecks in Netflix traffic in 2013, months before net neutrality was overturned. Comcast has been accused of doing the same in years past. And Netflix has been of particular concern in the wake of the December ruling. Ars Technica investigated the issue specifically with Verizon last week and didn’t find proof that Verizon was selectively throttling traffic. Nor did they find proof that Verizon isn’t; it’s simply not possible to tell from the outside one way or the other right now. Perhaps the FCC, with its interim case-by-case stance on net neutrality, will eventually take a look. In the menatime, want to check out how your own connection compares nationally or internationally? Hit up the Netflix ISP Speed Index and have fun with all the graphs and tables they provide.